If your abilities allow, you can use a continuous ceiling track and motor to move conveniently and independently between rooms. Access the bath on your own with a SureHands Body Support or Seat Sling. You can also move independently from a wheelchair directly into a tub. Ask your SureHands representative to work with you to design a system that allows for access to the tub, the toilet and the bed. SureHands specializes in customized lift solutions for the home. A ceiling lift, a mobile lift, a wall lift or a stand-assist can all be used with the assistance of an attendant to make safe and easy transfers. All SureHands Lifts can be used with a SureHands Body Support or a SureHands Sling to reduce the risk of injuries to the user and the caregiver. It is possible to get in and out of bed independently if your abilities allow. A SureHands ceiling lift and Body Support can take you directly from your bed to other rooms, helping you to achieve the highest level of independence possible. 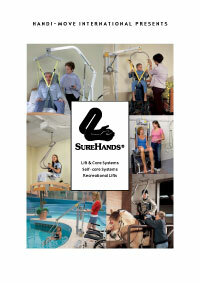 Ask your SureHands representative for a free in-home demonstration to determine the best lifting solution for you. If your abilities allow, you can use a continuous ceiling track and motor to move conveniently and independently between rooms. Access the bath on your own with a SureHands Body Support or Seat Sling. You can also move independently from a wheelchair directly into a tub. Ask your SureHands representative to work with you to design a system that allows for access to the tub.